Knight Runner: The Knight is Back! A week after my last LSD run two weeks ago, I had to refrain from running and even biking for the whole week, I had to sideline myself and really avoid doing any strenuous leg exercises in order for me to recuperate. While I had a week of no training, I devoted most of my time studying and doing my research for my MBA class. I thought of doing weight training, but I suddenly felt so tired the moment I decided to stop my physical activities. I have been non-stop since February when I started biking and eventually running after the Condura Run, so why not give myself a break and get the rest I truly deserve. After all, I owe it to my body. While recuperating, I have done most ITB stretching exercises in order to help relieve the pain. I have been applying hot compress to ease the pain quickly. One Saturday, I went to RUNNR store to have a Gait Analysis, and it turned out that I am an over pronator. Then as the staff was explaining to me, I learned that there are different types of shoes, there is the cushion shoes, stability shoes, and motion control shoes. I was advised to use a stability shoes. It was only then that I learned about different types of running shoes. Anyway, I ended up buying a new pair, unfortunately, I did not buy on the day that I went to RUNNR (sorry, but I vowed to go back and purchase at your store in the next weeks to come). I bought my shoes 3 days after at New Balance store in Festival Mall in Alabang, I got the NB 1224 stability shoes, and yes, I have used it already. I started to run Sunday afternoon last week, took a 6km distance with very slow pace inside the village and good thing there was no pain in my right knee. I felt that pushing it further would not do me any good. Then Tuesday, I started to break in my new shoes, took a lot of stretching before running just to make sure that I dont feel any pain. After 6km, knee feels ok and my breathing was fine, so i decided to ran further and I ended up completing a 10km run! Feels good again, and at this point I knew that i can get back to my training plan. Come Wednesday, as most runners did, (where they offered a run to bid farewell to our former President Cory), I myself had my own contribution by running in our village. I scheduled an afternoon run but I had to wait for the rain to stop. Surprisingly, I did another pain free 10k run. It was rest day on Thursday, and took another 6k run on Friday. Finally, today was another scheduled LSD run for the Gone Running Club, I am scheduled to run 15k. We assembled 5am and took the usual route from Paseo Sta Rosa - Nuvali - Lasalle - Paseo to complete the 15k run. As we took off, I was surprised with the fast pace of Jay, Val, Kuya Erning, and Vince. I was running behind the pack at take off, but I had to slow down as I can't run at their pace, As planned, I took a slow pace and still mindful of my knee. I havent completed this 15k route since we started our sunday runs because of my injury. But I was confident that I can finish it today since the weekday runs were all good. It was a great run, the weather was good, and I was enjoying it. The best part of my run was at my 11th km, I was running at 6:15km/min, (must have been my second wind). Well for my speed, that was fast already, I hope to improve further in the next weeks to come (no need to rush!). On the 12th km onwards, pace was steady at 7:00k/min. I ended up finishing 16k today and this was the farthest distance that I have ever ran. I guess Im back, and I do wish that the succeeding runs will be injury free! Nice to hear you're back. As you said, keep running! thanks bro! are you running Kenny's on sat? Thanks. 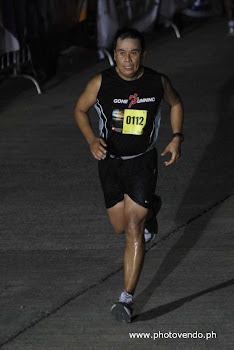 Hope you can join us in our next LSD (Aug 23), route is Paseo-Nuvali-Westgrove-Lasalle.. Run safely.. Your next long run route sounds great. Hope I can join. How was the Urbanite Run? Fun Run and Politics, Not a good match..